Give my regards to Broadway – 55 that is, where the Transport for London big-knobs reside with probably not far short of as many six-figure salaries per employee than at a Premier League football club. Yet still they lack the expertise or enthusiasm to eradicate the most shamefully inept customer information whiteboard which is on full display in the Pentonville Road ticket office at King’s Cross. Pay it a visit if you can. This “Good Service”, “Crap Service” whiteboard is less superior in quality and professionalism than my eight-year-old daughter’s art project. It’s symptomatic of everything that’s wrong in public transport, for TfL read many other organisations where, for all the flatulent, fawning flavour of the month company guff spewed in meeting rooms on floor upon floor of office space, for all the strategic chuntering, the empty promise vision, values and behaviours talk, by self-righteous, arse-kissing, “look at me”, org-chart climbers, no one can get off their fat, lazy backsides and shove their corporate pill-sucking heads above the parapet to get to grips with the reality of what faces us customers on a daily basis. The horrific whiteboard at King’s Cross has a list of the lines and the usual white service message that is stuck next to it. Except, the London Overground is obviously such a temporary line that it doesn’t warrant a permanent sticker, but a hand-written, smear and sellotape-ridden DIY piece. The network is obviously cautious when it comes to its experiences of running a delay-free proposition, as it has run out of ‘Good Service’ cards, and so the dear old Waterloo & City line, a poor relation, has its own hand written version. The Central Line, meanwhile, is running a ‘Good ervice’ but the font size is bigger than other lines, to compensate, whilst the card has been cut too tight on the Northern, so we have not far short of a ‘ood service’. All this framed by the most scruffily hand-written date and time. So, what’s the big deal about all this – it’s only a whiteboard, after all? I guess I may be a bit prickly as, not far short of two decades ago, I was part of the team at London Underground that designed and introduced these whiteboards, and then helped them migrate into the electronic versions that are present everywhere else at King’s Cross, except the poor old Pentonville gaol side of the station. What irks me most is that for all the humongous investment in technology, the high pay rates of tube staff and managers, and indeed employee numbers that dwarf other comparable transport operations, they still can’t get it right in what is a key location with high footfall and a showcase to their network. Weeks on end this whiteboard has stood dispiritingly unloved. How often has a manager walked past it? How often, indeed does he or she even bother to venture over to this side of the station, away from the magnificently re-developed, palatial St Pancras International side of King’s Cross? Probably very rarely, if at all. If those in charge did, then surely they would also identify and do something about the unsightly chipboard that covers up a boarded-up door at the bottom of the stairs leading to the ticket hall. Or they’d notice the dust and grime that has accumulated so greatly it is now the size of mothballs or lichen off my model railway. Or they’d take-in the dated 1980s Network South East-style subway panels and paint-colours that so abruptly create a divide between one side of the station and the other, and press the case to the purse-holders to properly complete the transformation works. They’d also do something about the lopsided posters stuck to the wall with black and yellow hazard tape, rather than in a proper poster frame – these very posters unappetisingly trying to sell the concept of Oyster card to customers who, in the middle of the rush hour, are deprived of any ticket office service, both windows belligerently shut. Subconsciously, the staff appear to have been affected by their surroundings. They don’t have the spring in the step that their colleagues have the other side of King’s Cross, there’s not that level of urgency, that sense of anticipating customer needs, though the affable lady that updates our beloved whiteboard does at least ask why I am taking a photo of this masterpiece. I half-joke that it looks a right state and she just stares straight through me, nonplussed and dumbfounded at why I’d even suggest there is anything at all wrong with what is on display. I genuinely don’t think anyone really gets it here. I return to the palatial side of Kings Cross Tube station a couple of times during the week – the gateline staff are admittedly faultless. There’s one small old bloke who detains customers to give them the most fulsome and copious customer information. He’s an absolute gem and he’s not the only one – they’re a very professional and alert bunch. The ticket office less so, and they seem to have that unedifying railway habit of thinking that using a Post Office-style queuing system gives them carte blanche to be aloof and dismissive. “You’ve got to wait until I call you to my window, you can’t come any sooner,” snarled the overbearing, odious moron behind the furthest counter with his face screwed-up to reveal more lines than on the Tube map as he chastised a bedraggled elderly lady last week. He was sitting at his window shuffling paperwork as though his administrative duties were more important than serving customers. Give rail employees the power of a button that lights up that they are ready to serve you at their window and they think they are world leaders. At conventional ticket offices, where customers make their way to the window as soon as the person in front has disappeared, there’s no hideaway for the member of staff to have a quick break or let his colleagues at adjacent booths take the strain. Clearly, none of them have been given any training in ensuring that the Post Office system actually drives rather than diminishes customer satisfaction. Hopeless. When I started my career in 1993 at London Underground, I made it my place on Day One to get hold of a copy of the Fennell Report into the 1987 King’s Cross fire. It was compelling and essential reading and I hoped as a manager of stations and leader of people, I could learn the lessons of the past. I turned page after page, hanging on every word that charted the gradual collapse in standards that in some shape or form, irrevocably ended in disaster. This was an era regaled in finer detail, almost affectionately, during my induction programme, by elder peers or so-called mentors of binge drinking on duty, the lack of leadership at frontline and senior levels, the culture of contempt towards customers (“self-loading freight”, “punters or passengers, but never customers”), no quality control of the customer proposition, all this leading to an emergency situation that staff were ill-equipped to deal with. When the blaze was about to take hold, two employees were apparently pre-occupied with each other in a cupboard. Back then, the spectre of King’s Cross was fresh in our memory, no price was too great, no time better invested, in doing something, indeed anything, that might stop at source any slightest aberration or bad practice that might one day somehow cause a repetition. Standards across London Underground have been revolutionised since this nadir, particularly under Mike Brown’s stewardship, as has managerial competence and focus, and I’m not melodramatically suggesting that another tragedy beckons. However, I just find it disconcerting to see, within King’s Cross of all places, let alone anywhere else, a dereliction of duty towards customers and basic management that hints at a throwback to the bad old days. 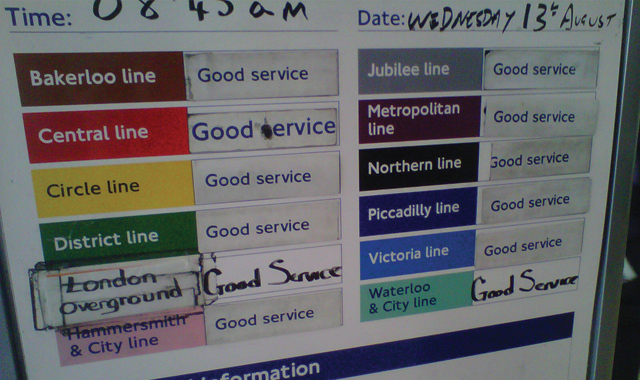 VERDICT: That whiteboard tells a tale more informative than that there is a “Good ervice” on the Central line and that’s why it will be interesting to see how long it takes before someone puts their head above the parapet and replaces it. I’ve started counting. We shall see.